Sumba on Istanbul: "an ancient city full of history, sights and the best food"
LONDON, England (CNN) -- In June we asked you which city you would like to see featured on the My City_My Life show, and you wrote to us with lots of ideas. They ranged from European capitals such as London, to distinct cultural hubs of South America, like Mexico City. 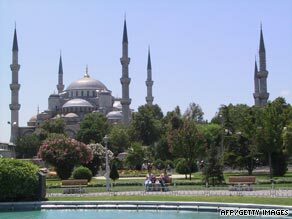 The Blue Mosque, famed for its blue tiled interior, rises above Sultanahmet Park in the Old City of Istanbul. A few of you suggested a trip to Istanbul in Turkey, including Sumba who said it's "an ancient city full of history, beautiful sights and the best food." Many of you suggested visiting the U.S. with suggestions ranging from Pittsburgh to Santa Barbara. Some of you recommended cities in the Far East; Brent Deverman wrote "Shenzhen, China, is the only place you can watch fireworks over the Eiffel Tower on top of a Spanish galleon. This boomtown has the right mix of people and features from beaches to factories." Esteban suggested we head to South America to enjoy the distinct cultures in Mexico City. "It's huge and chaotic and beautiful and vibrant. It's the crossroads of two distinct cultures: indigenous Mexican and European. It has an incredibly unique character all [of] its own," he wrote. Other suggestions included Dubai, Buenos Aires, Kiev and San Salvador in Central America.